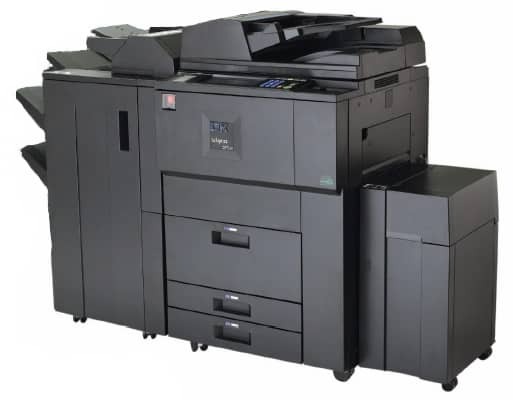 The IBM Infoprint 2075ES offer a modular design that gives you the choice of features you need today as well as future expansion opportunity. These printers are designed to meet the need for moderate output speed, moderate duty cycles and flexible capabilities while helping you achieve low operating costs. Print up to 75 with up to 8,100 sheet input capacity. Simplify walkup copying with integrated scanning at up to 60 and 75 ipm2 (respectively) and automatic document feeding capabilities. Produce high-quality images and graphics. Optimal performance and flexibility for high-quality, high-function cutsheet printing effectively combined with copying/scanning capabilities. Improve your cost of ownership. Consolidate production printing and copying needs into a single device. Use Web-pull printing or direct printing to submit jobs faster. Print attachments directly from an e-mail to save time. Scan information in directly to e-mail, server or fax. Send jobs, identified by a PIN, to be held for later release to maximize security. Enable two-way communication and page-level error detection and recovery.